Earn up to 91,992 reward points. Marimbas built with Marimba One's Premium Keyboard and original Classic resonators are rare combinations of acoustic elements. Marimba One selects the Rosewood bars of each keyboard from several thousand bars. The rich harmonics of our Classic Resonators blends perfectly with the dynamic volume, articulation, and resonance of the Premium keyboard. The frame is fully height adjustable using gas springs in the end frames so it is effortless to raise and lower the keyboard. We have also laser engraved tape measures into the end frames so you will always know your exact keyboard height. Our Wave Lock System utilizes cam levers and was designed to make the set up and adjusting of the frame or accessory bar the easiest and fastest of any frame available - No more bolts or wing nuts to strip or lose! 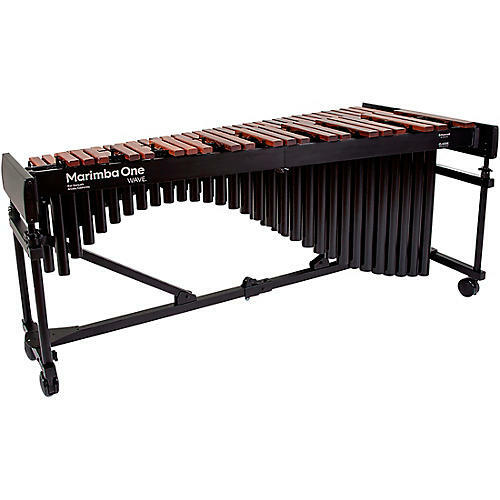 Whether you are in an indoor or outdoor front ensemble, contemporary percussion ensemble, or symphony orchestra, the Marimba One Wave instrument ican handle all of your performance needs in one package. Please note, the Marimba One Wave also offers an optional quick-release accessory bar. This square, non-slip, heavy-duty front accessory bar runs the entire length of the frame and can be mounted with any percussion accessory you need for your performance. Using any square rack clamps on the market, you can attach your cymbals, drums, wind chimes, electronics, and much more with confidence.